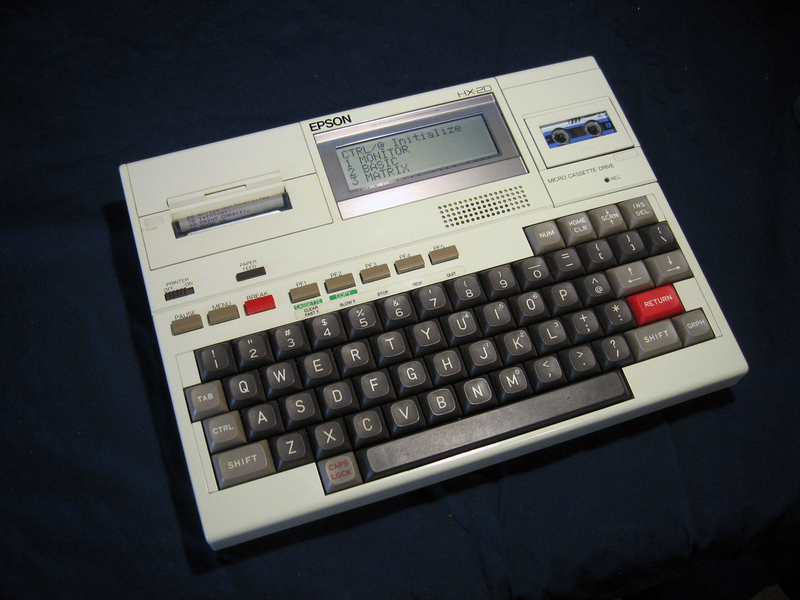 Released in 1981 the Epson HX-20 was one of these units that could maybe claim the title of the first laptop. The hardware for its time was innovative! Its tiny screen 120 x 32 pixel LCD screen wasn't really up to word processing but there was a full 16K 8-bit computer there under the hood. Not only the computer, but tape storage and printer output was also included in the one package. Its extended BASIC was full of features and it could store programs in RAM for immediate use later. In the early 80s this was a very popular unit, especially for tasks like data collecting or monitoring equipment. It came in a robust plastic case that could take the knocks of computing on the go. I got hold of this one in April 2008. It needed a Nicad battery refit and some new printer tape but apart from that it is in great condition and fighting fit. The keyboard's got a good positive feel and everything works. Want to know more about this micro? Google is your friend.